Become pretty average (though that is good for Kilburn I suppose) but the ales were the big let down this time as they were between mediocre and dire. Gastropub that is absolutely rammed with young professionals come 6am. Nice outside seating area to take in the buzzing metropolis that is Kilburn High Road. No reason to seek this place out, although it's by far the classiest joint in the area. Poor selection of ales on a visit last Monday. Just a light and dark from the Twickenham Brewery. Cliqueish atmosphere so we didn't stop for long. Not my kind of pub. 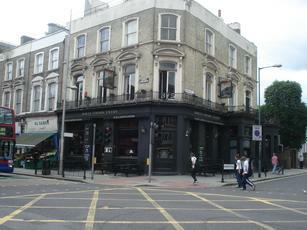 This is a great pub with one of the best selections of ales I've seen in a pub in London. Very efficient staff and very friendly too. The food is good and reasonable cost for a gastro. Its a real shame the owners of the Black Lion dont take a few tips from this place. Service is awful there and one very poor ale on offer. Always choose this place over the Black lion.